1. Preheat the oven to 220°C, gas mark 7. Cook the carrots and broccoli in a large pan of boiling water for 5 minutes. Remove with a slotted spoon. Add the celeriac to the same water and cook for 3 minutes then drain. 2. 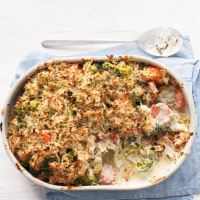 Heat the soft cheese and milk in the pan then stir in the carrots and broccoli. Transfer to an ovenproof dish. 3. Mix the celeriac with the horseradish and parsley and spoon over the carrot mixture. Bake for 30 minutes until golden.